Diatomaceous Earth. This is a mix from our last recording (March 4th, 2016). 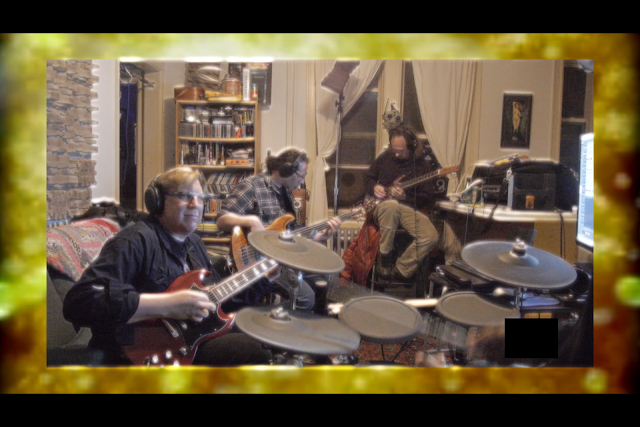 Lou Clark on drums, Ethan Rosenblatt on bass guitar, Greg Bartus and me (Andrew Bellware) on guitars. Hedonic Treadmill was just an end-of-the-night jam. Could it be shorter? Probably. Will it be? I... I don't know. I could make a guess about what we're all playing through. Greg through his preamp rack and then into... hmm... Maybe the ART tube preamp? Probably. Ethan is certainly going direct into the ART tube preamp (the other channel). I'm going through a Kemper profiler amp and then into a Lindell mic preamp. Lou is playing sounds from the Abbey Road late 60's kit. The bass is going through a GK amp simulator. And everybody's getting hit with noise reduction and a wide variety of compression.